The train was packed with men. Men lying as still as if they were already dead. Men shaking with pain. One man raving, jabbering, yelling, in delirium. Everywhere bandages . . . bandages . . . bandages . . . and blood. Those words describe the moment when Private John Lewis Barkley first grasped the grim reality of the war he had entered. The rest of Barkley's memoir, first published in 1930 as No Hard Feelings and long out of print, provides a vivid ground-level look at World War I through the eyes of a soldier whose exploits rivaled those of Sergeant York. A reconnaissance man and sniper, Barkley served in Company K of the 4th Infantry Regiment, a unit that participated in almost every major American battle. The York-like episode that earned Barkley his Congressional Medal of Honor occurred on October 7, 1918, when he climbed into an abandoned French tank and singlehandedly held off an advancing German force, killing hundreds of enemy soldiers. But Barkley's memoir abounds with other memorable moments and vignettes, all in the words of a soldier who witnessed war's dangers and degradations but was not at all fazed by them. Unlike other writers identified with the "Lost Generation," he relished combat and made no apology for having dispatched scores of enemy soldiers; yet he was as much an innocent abroad as a killing machine, as witnessed by second thoughts over his sniper's role, or by his determination to protect a youthful German prisoner from American soldiers eager for retribution. This Missouri backwoodsman and sharpshooter was also a bit of a troublemaker who smuggled liquor into camp, avoided promotions like the plague, and had a soft heart for mademoiselles and frauleins alike. In his valuable introduction to this stirring memoir, Steven Trout helps readers to better grasp the historical context and significance of this singular hero's tale from one of our most courageous doughboys. 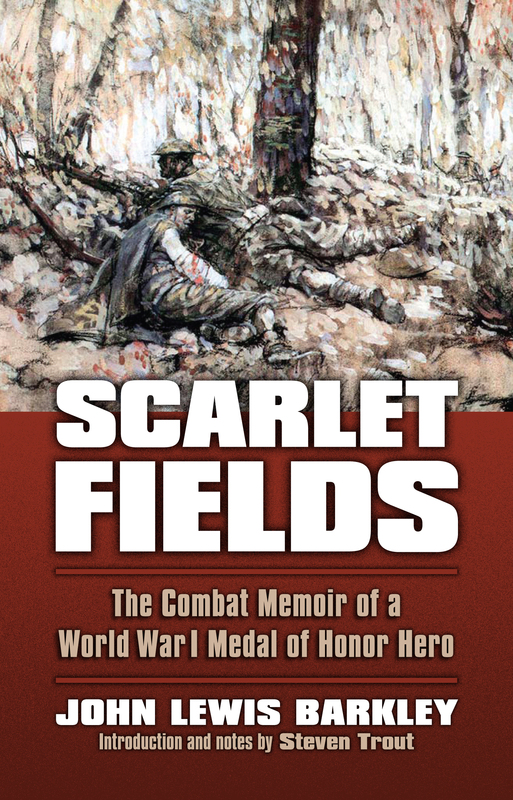 Both haunting and heartfelt, inspiring and entertaining, Scarlet Fields is a long overlooked gem that opens a new window on our nation's experience in World War I and brings back to life a bygone era. Steven Trout chairs the English Department at the University of South Alabama in Mobile. His most recent book is On the Battlefield of Memory: The First World War and American Remembrance, 1919–1941.